What do you get when you combine an Airstream, delicious cheese and a precious goat named Valentine? Belle's Big Adventure! 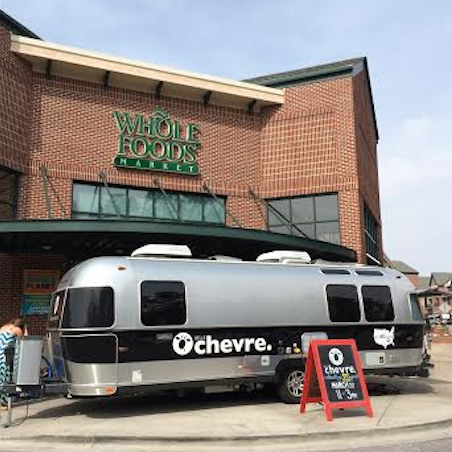 In case you've missed the details, here's a refresher from the Belle Chevre website: "To celebrate Belle’s 25th birthday, we are partnering with Airstream, Inc and setting off on an All-American road trip to share our 'goat cheese gospel' with the masses." Sounds great, right? Well, we went behind the scenes for an interview with Tasia Malakasis, Artisan Cheesemaker at Belle Chevre, to hear about the inspiration behind the #LiveRiveted adventure. Check it out! Where did the concept of Belle's Big Adventure come from? Belle's Big Adventure - going cross country handing out our yummy chevres - is really taking a page out of Ben & Jerry's book from their beginnings when their brand was burgeoning. Plus what else could be more fun that getting out and seeing existing friends/fans of our products and making new friends? And to do it in style with an Airstream? Priceless! The goal is to hit every state and we have mapped out Part 1 and Part 2 here on this map and calendar. How did you decide to use an Airstream to travel the nation for your tour? What's your favorite thing about Airstreams? Sleek design, attention to detail, and ease of use. A majority of Belle Chevre's team are designers (not on purpose) as we are always trying to improve what we do with our classic chevres - form and function and innovation. We are attracted to companies who have accomplished all of those elements and Airstream is one of the best examples. How is Valentine liking the Airstream? Valentine has exceptional taste too and she insisted in traveling in style with the Airstream. She is a huge fan! What does Live Riveted mean to you? Even though technically rivet means to attract or fasten to me Live Riveted means to live free. That is what I think of when I think of Airstream - freedom and adventure. So maybe being "attached" to those ideals is a better way to explain how I feel about Live Riveted. What's next for Belle's Big Adventure? To follow along with Belle's Big Adventure, check out the #bellesbigadventure hashtag, and be sure to show them some love if the adventure comes to your town! In the mean time, check out this great kick-off video!